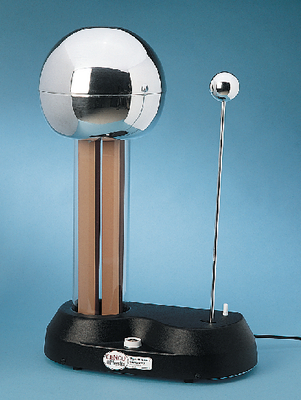 Based on the well-known Van de Graaff system, our newly improved design features a large 28cm diameter collector sphere, a substantial 12.5cm diameter x 56cm high transparent insulating column, a completely enclosed base with a variable-speed motor, and an integrated discharger on a movable arm for controlling the length of the sparks and discharging the sphere after use. The long column and the smooth finish substantially reduce charge loss by leakage and spray discharges, which results in improved reliability and greater maximum spark length. The generator can develop voltages up to 400kV under favorable conditions. The low average current of about 10μA or less prevents harmful shocks. Peak current generated is about 50μA. Operates under all humidity conditions encountered in the classroom. With 3-wire line cord and switch for 110V, 50/60Hz. Note: Available to US customers only.